Sixteen years after the jihad carnage of September 11, 2001, notwithstanding the treacly apologetics forced upon the American public by our politico-religious and academic “leaders”, we must never forget the mainstream Islamic jihadism and Jew/Infidel-Hatred manifested that day, continues apace. We Americans, with our singular heritage of religious freedom, endeavor to think the best of all faiths. But the past four years—since Sept. 11—have challenged our accustomed ecumenism. The questions arise: How much do we actually understand about Islam, and is it compatible with liberal democratic ideals that evolved, uniquely, in the West? Elected leaders tell us that Islam is a religion of peace and that the Muslim terrorists who destroyed New York’s World Trade Center, slaughtering 3,000 noncombatants, adhered to a perverted form of their own faith. Muslim leaders in America now routinely condemn terrorist acts against innocent civilians. “Islam considers the use of terrorism to be unacceptable for any purpose,” declared the Muslim Public Affairs Council (MPAC) after the recent bombings in London, also perpetrated by Muslims. 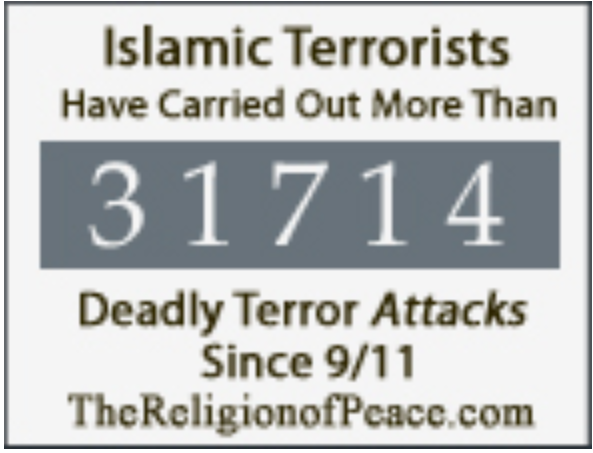 “MPAC condemns the exploitation of people and issues, regardless of the perpetrators and their justifications.” Although Muslim spokesmen may condemn the killing of innocents—neglecting to make explicit who “qualifies” as innocent—few have spoken up to condemn and disown the Islamic doctrine of jihad. The reason may be that jihad, which means “to strive in the path of Allah,” is so much a part of Islamic faith and history, it represents a permanent Muslim institution. The foundations of the institution are found in the Quran. Sura (chapter) 9 is devoted in its entirety to war proclamations. There we read that the Muslim faithful are to “slay the idolaters wherever you find them. . . . Fight against such as those who have been given the scripture as believe not in Allah. . . . Go forth, light-armed and heavyarmed, and strive with your wealth and your lives in the way of Allah. That is best for you, if ye but knew.” From such verses in the Quran and in the “hadith” (i.e., words and deeds of Muhammad, recorded by pious transmitters), Muslim jurists and theologians formulated the Islamic institution of permanent jihad war against non-Muslims to bring the world under Islamic rule (Sharia law). Muhammad himself started things off with a series of proto-jihad campaigns to subdue the Jews, Christians and pagans of Arabia. Within a century of his death in 632, the jihad wars of his successors had expanded the Muslim empire from Portugal to Pakistan. Later Muslim conquests continued in Asia, Africa and Eastern Europe. The Christian kingdoms of Armenia, Byzantium, Bulgaria, Serbia, Bosnia, Herzegovina, Croatia and Albania, in addition to parts of Poland, Hungary and Romania, were conquered and Islamized. Arab Muslim invaders also engaged in continuous jihad raids that ravaged and enslaved sub-Saharan African animist populations, extending to southern Sudan. When the Ottoman Muslim armies were stopped at the gates of Vienna in 1683, over a millennium of jihad had transpired. These tremendous military successes spawned a triumphalist jihad literature. Muslim historians recorded in detail the number of infidels slain, or enslaved and deported, the cities and villages pillaged, and the lands, treasure and movable goods seized. Christian and Hebrew sources, and even the scant Hindu and Buddhist writings that survived the ravages of the Muslim conquests, independently validate this narrative and complement the Muslim perspective by providing testimonies of the suffering of the non-Muslim victims of jihad wars. Later centuries saw Muslim fortunes decline. Many conquered lands liberated themselves from Muslim rule. But the ideology of jihad was handed down unchanged to all future Muslim generations. “Even today, the study of the jihad is part of the curriculum of all the Islamic institutes,” wrote Lebanese law professor Antoine Fattal in 1958. “In the universities of Al-Azhar, Najaf and Zaitoune, students are still taught that the holy war (jihad war) is a binding prescriptive decree, pronounced against the Infidels, which will only be revoked with the end of the world.” Sadly, almost 50 years since Fattal made his observations, learning the Manichean theory of jihad war remains an integral part of the formal education of many Muslim youth. The historical record demonstrates that this jihad war theory has been put into practice by Muslims across the globe for well over a millennium through present times. This fourth anniversary of the carnage of 9-11—caused by a major act of jihad terrorism—would be an appropriate occasion for contemporary Muslim clerical and ruling elites to formally acknowledge, renounce and begin dismantling the devastating Islamic institution of jihad war. Despite significant corroborating evidence—from a local New Jersey police report and a northeastern US FBI account (a plethora of complaints dubbed “Happy Muslim calls” by agents), to a compilation of local New Jersey eyewitness accounts, and even a contemporaneous, if begrudging, Washington Post story summary assessment—Donald Trump continues to be pilloried for his contention that large numbers of New Jersey area Muslims celebrated the 9/11 carnage. Gameia’s interview (original Arabic; extracts translated here) was rife with conspiratorial Islamic antisemitism, which riveted upon his invocation of the central Koranic motifs of Jew-hatred. Al-Azhar’s representative to the U.S. melded this sacralized anti-Jewish bigotry to virulent calumnies against Americans, and threats to the U.S.—witless “dupes” of the Zionist Jews. The Jewish element is as Allah described it when he said: “They disseminate corruption in the land.” [Koran 5:33; 5:64] We know that they have always broken agreements [4:155; 5:13], unjustly murdered the prophets [Koran 2:61; 2:87; 2:91; 3:112; 4:155], and betrayed the faith [2:42; 2:75; 2:89] . Can they be expected to live up to their contracts with us? These people murdered the prophets; do you think they will stop spilling our blood? No. You see these people (i.e. the Jews) all the time, everywhere, disseminating corruption, heresy, homosexuality, alcoholism, and drugs. [Because of them] there are strip clubs, homosexuals, and lesbians everywhere. They do this to impose their hegemony and colonialism on the world. Now, they are riding on the back of the world powers. These people always seek out the superpower of the generation and develop coexistence with it. Before this, they rode on the back of England and on the back of the French empire. After that, they rode on the back of Germany. But Hitler annihilated them because they betrayed him and violated their contract with him. We saw these Zionists, just one hour after the event [the 9/11 attacks], broadcasting on the BBC, the biggest media channel, that the Arabs, and particularly the Palestinians, were celebrating and rejoicing over the American deaths. Unfortunately, this incident made the American people hate everyone who is Muslim or Arab. What can you expect when you think, first off, that fifty thousand have died and the Arabs are celebrating? How would you feel as an American? Of course you’d want revenge. This is what the Jews plotted and planned. They used the Arabs to carry it out. All the signs indicate that the Jews have the most to gain from an explosion like that. They are the only ones capable of planning such acts. First of all, it was found that the automatic pilot was neutralized a few minutes before the flight, and the automatic pilot cannot be neutralized if you don’t have command of the control tower. Second, the black boxes were found to contain no information; you cannot erase the information from these boxes if you do not plan it ahead of time on the plane. Third, America has the most powerful intelligence apparatuses, the FBI and the CIA… How did [the perpetrators] manage to infiltrate America without their knowledge? Fourth, Jews control decision-making in the airports and in the sensitive centers in the White House and the Pentagon. Fifth, to date America has presented no proof incriminating Osama bin Laden and Al-Qa’ida. If we take these things into account and look closely at the incident, we will find that only the Jews are capable of planning such an incident, because it was planned with great precision of which Osama bin Laden or any other Islamic organization or intelligence apparatus is incapable…I told the American officials that the American people cannot, at this critical stage, know the real enemy who struck at its heart if it does not awaken from its slumber and stop blaming the Arabs and the Muslims…On the news in the U.S. it was said that four thousand Jews did not come to work at the World Trade Center on the day of the incident, and that the police arrested a group of Jews rejoicing in the streets at the time of the incident… This news item was hushed up immediately after it was broadcast… The Jews who control the media acted to hush it up so that the American people would not know. If it became known to the American people, they would have done to the Jews what Hitler did!…Muslims do not feel safe even going to the hospitals, because some Jewish doctors in one of the hospitals poisoned sick Muslim children, who then died. [A]fter the incident, things deteriorated. All [commercial] activity with anyone found to be a Muslim or an Arab was immediately halted, and the federal bureaus stopped matters. Furthermore, he was thoroughly investigated, and asked: “Why did you come to America? What is your connection to Osama bin Laden? What do you know about the [Islamic] Jihad, Hamas, and Hizbullah organizations?” Therefore, the Muslim feels imprisoned…Following the incident, Muslims and Arabs stopped feeling that it was safe to leave [their homes]… They stopped feeling that it was safe to send their wives to the market or their children to the schools. The Muslims are being persecuted by the people and the federal government. This is the result of the bad image of Muslims created by the Zionist media, and of their presenting Islam as a religion of terrorism. That is why the Americans have linked the recent incidents to Islam. I personally have suffered; my home was attacked and my daughters were harassed. As President Bush said, this is a crusade against Islam and against Muslims…He went to the Islamic center in Washington and took back his words, but he did this only after he incited the souls and revealed what happened behind the scenes of American policy. For this reason, I advise every Arab and every Muslim leader not to offer any aid whatsoever to the oppressing superpower [to help it] attack Muslims, because this is a betrayal of Allah and his Prophet… An American attack on Afghanistan will constitute terrorism, as the U.S. did in Iraq and in Palestine… I think that this war will be the end of America the oppressor. I see America as the second ‘Aad (according to Islamic tradition, ‘Aad and Thamud were two Arab tribes that were annihilated because they deviated from the path of Allah; see Koran 7:73–74)… The U.S. has the same traits as the first ‘Aad: it has skyscrapers and large factories. Allah will impose on the people of the second ‘Aad (i.e. the Americans) what he imposed on the people of the first ‘Aad, because they are a people who are arrogant in their power, but Allah will avenge himself on them.